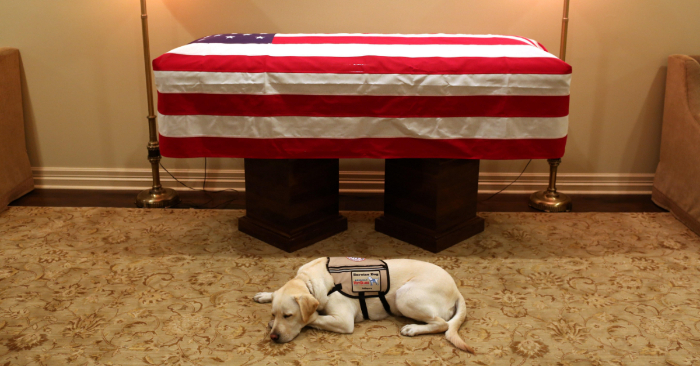 Americans were captivated and touched last week by the images and story of Sully, the yellow Labrador service dog to former President George H.W. Bush. This attention offers a terrific opportunity to spread the word about the critical role of service dogs, their training, what they do and what we can do to help. Service dogs are highly-specialized and indispensable animals that perform a wide array of tasks. This ranges from helping to retrieve medications to sensing and stopping dangerous panic attacks that can disrupt and severely compromise the handler’s life. While service dogs help many populations of people in need, they are emerging perhaps most visibly in the public consciousness as one of the key weapons in the battle to quell the epidemic of veteran suicide. Every day 184 veterans are diagnosed with post-traumatic stress (PTS) and tragically, 20 of them take their own lives. At the same time, some 670,000 beautiful dogs are euthanized in the nation’s shelters each year. To help stem the tide of veteran suicide and save unadopted animals, American Humane established the “Pups4Patriots” program, which rescues abandoned dogs in need of forever homes and trains them to become lifesaving service dogs for veterans coping with PTS and traumatic brain injury free of charge. Unfortunately, there are far too few service dogs, and just as worrisome, far too few adequately trained service dogs to meet the need. That’s why, even though lives are in the balance, waiting lists for service dogs continue to be unacceptably long — often up to 18-24 months. The training process for a service dog is both time-consuming and expensive, costing as much as $30,000 per dog. But their contributions are more than worth the investment. Vast anecdotal evidence and a growing body of scientific research show that specialized PTS and TBI service dogs can offer life-changing — and often lifesaving — support to affected veterans. That’s why it’s incumbent upon us to more fully and more widely harness the remarkable healing powers of the human-animal bond for those in need. We can all do our part. When you see a service dog in your local coffee shop, a grocery store or an airport, please remember they are not pets. They are trained to work and assist people diagnosed with a physical or psychiatric condition. While it could be tempting to greet them as you would your own dog, it’s best not to approach them or pet them when they are working. We can also advocate for more, better-trained service dogs for those in greatest need. American Humane has worked with the nation’s leading experts to develop the first national standards for training PTS and TBI service dogs and we are now working with members of Congress to pass the “Pups for Patriots Act,” directing the Department of Veterans Affairs to provide more lifesaving service dogs trained according to these rigorous standards to veterans grappling with the invisible wounds of war. In conjunction with a national registry to distinguish real service dogs from phony ones, these efforts will help improve access for veterans with service dogs to hotels, taxis and other public places. Heroic dogs like Sully bring hope, help and healing every day to those in greatest need — from privates to presidents. Let’s pay tribute to Sully’s inspiring example and provide more lifesaving animals to serve those who have served our country.